O Most merciful God, who, amongst other admirable endowments, didst privilege blessed Elizabeth with the gift of making wars cease: grant, by her prayers, that after having enjoyed the peace, which we humbly crave in this mortal life, we may be received into everlasting bliss. Through our Lord Jesus Christ, thy Son, who liveth and reigneth with thee, in the unity of the Holy Ghost, God, world without end. Amen. In the footsteps of Margaret of Scotland and of Clotilde of France, a third Queen comes to shed her brightness on the sacred Cycle. Born at the southern extremity of Christendom, where it borders on Mussulman lands, she was destined by the Holy Ghost to seal with peace the victories of Christ, and prepare the way for fresh conquests. The blessed name of Elizabeth, which for half a century had been rejoicing the world with its sweet perfume, was given to her, foretelling that this new-born child, as though attracted by the roses which fell from the mantle of her Thuringian aunt [St. Elizabeth, Duchess of Thuringia, a.k.a St. Elizabeth of Hungary], was to cause these same heavenly flowers to blossom in Iberia. There is a mysterious heirship among the saints of God. The same year in which one niece of Elizabeth of Thuringia was born in Spain, another, the Blessed Margaret of Hungary, took her flight to heaven. She had been consecrated to God from her mother's womb, as a pledge for the salvation of her people, in the midst of terrible disasters; and the hopes so early centred in her were not frustrated. A short life of twenty-eight years spent in innocence and prayer, earned for her country the blessings of peace and civilization; and then Margaret bequeathed to our Saint of to-day the mission of continuing in another land the work of her holy predecessors. The time had come for our Lord to shed a ray of His grace upon Spain. The thirteenth century was closing, leaving the world in a state of dismemberment and ruin. Weary of fighting for Christ, kings dismissed the Church from their councils, and selfishly kept aloof, preferring their own ambitious strifes to the common aspiration of the once great body of Christendom. Such a state of things was disastrous for the entire West; much more, then, for that noble country where the Crusade had multiplied kingdoms as so many outposts against the common enemy, the Moors. Unity of views and the sacrifice of all things to the great work of deliverance could alone maintain in the successors of Pelayo the spirit of the grand memories of yore. Unfortunately these princes, though heroes on the battle-field, had not sufficient strength of mind to lay aside their petty quarrels and take up the sacred duty entrusted to them by Providence. In vain did the Roman Pontiff strive to awaken them to the interests of their country and of the Christian name; these hearts, generous in other respects, were too stifled by miserable passions to heed his voice; and the Mussulman looked on delightedly at these intestine strifes, which retarded his own defeat. Navarre, Castile, Aragon, and Portugal were not only at war with each other; but even within each of these kingdoms, father and son were at enmity, and brother disputed with brother, inch by inch, the heritage of his ancestors. Who was to restore to Spain the still recent traditions of her Ferdinand III? Who was to gather again these dissentient wills into one, so as to make them a terror to the Saracen and a glory to Christ? James I of Aragon, who rivalled St. Ferdinand both in bravery and in conquests, had married Yoland, daughter of Andrew of Hungary; whereupon the cultus of the holy Duchess of Thuringia, whose brother-in-law he had thus become, was introduced beyond the Pyrenees; and the name of Elizabeth, changed in most cases into Isabel, became, as it were, a family jewel with which the Spanish princesses have loved to be adorned. The first to bear it was the daughter of James and Yoland, who married Philip III of France, successor of St. Louis; the second was the grand-daughter of the same James I, the Saint whom the Church honours to-day, and of whom the old king, with prophetic insight, loved to say, that she would surpass all the women of the race of Aragon. Inheriting not only the name, but also the virtues of the “dear St. Elizabeth,” she would one day deserve to be called “the mother of peace and of her country.” By means of her heroic self-renunciation and all-powerful prayer, she repressed the lamentable quarrels of princes. One day, unable to prevent peace being broken, she cast herself between two contending armies under a very hailstorm of arrows, and so forced the soldiers to lay down their fratricidal arms. Thus she paved the way for the happy event, which she herself was not to have the consolation of seeing: the re-organisation of that great enterprise for the expulsion of the Moors, which was not to close till the following century under the auspices of another Isabel, her worthy descendant, who would add to her name the beautiful title of “the Catholic.” Four years after Elizabeth's death, the victory of Salado was gained by the united armies of all Spain over 600,000 infidels, showing how a woman could, under most adverse circumstances, inaugurate a brilliant Crusade, to the immortal fame of her country. Elizabeth, of the royal race of Aragon, was born in the year of our Lord 1271. As a presage of her future sanctity, her parents, contrary to custom, passing over the mother and grandmother, gave her in Baptism the name of her maternal great-aunt, St. Elizabeth, Duchess of Thuringia. No sooner was she born, than it became evident what a blessed peacemaker she was to be between kings and kingdoms; for the joy of her birth put a happy period to the miserable quarrels of her father and grandfather. As she grew up, her father, admiring the natural abilities of his daughter, was wont to assert that Elizabeth would far outstrip in virtue all the women descended of the royal blood of Aragon; and so great was his veneration for her heavenly manner of life, her contempt of worldly ornaments, her abhorrence of pleasure, her assiduity in fasting, prayer, and works of charity, that he attributed to her merits alone the prosperity of his kingdom and estate. On account of her wide-spread reputation, her hand was sought by many princes; at length she was, with all the ceremonies of holy Church, united in matrimony with Dionysius, king of Portugal. In the married state she gave herself up to the exercise of virtue and the education of her children, striving, indeed, to please her husband, but still more to please God. For nearly half the year she lived on bread and water alone; and, on one occasion when, in an illness, she had refused to take the wine prescribed by the physician, her water was miraculously changed into wine. She instantaneously cured a poor woman of a loathsome ulcer by kissing it. In the depth of winter she changed the money she was going to distribute to the poor into roses, in order to conceal it from the king. She gave sight to a virgin born blind, healed many other persons of grievous distempers by the mere sign of the Cross, and performed a great number of other miracles of a like nature. She built and amply endowed monasteries, hospitals, and churches. She was admirable for her zeal in composing the differences of kings, and unwearied in her efforts to alleviate the public and private miseries of mankind. After the death of King Dionysius, Elizabeth, who had been in her youth a model to virgins, and in her married life to wives, became in her solitude a pattern of all virtues to widows. She immediately put on the religious habit of St. Clare, assisted with the greatest fortitude at the king's funeral, and then, proceeding to Compostella, offered there for the repose of his soul a quantity of silk, silver, gold, and precious stones. On her return home she consumed in holy and pious works all she had that was dear and precious to her; she completed the building of her truly royal monastery of virgins at Coimbra; and, wholly engaged in feeding the poor, protecting widows, sheltering orphans, and assisting the afflicted in every way, she lived not for herself, but for the glory of God and the well-being of men. On her way to the noble town of Estremoz, whither she was going in order to make peace between the two kings, her son and son-in-law, she was seized with illness; and, in that town, after having been visited by the Blessed Virgin, Mother of God, she died a most holy death, on the 4th day of July, in the year 1336. After death she was glorified by many miracles, especially by the sweet fragrance of her body, which has remained incorrupt for nearly three hundred years; and she is always distinguished by the name of the “holy queen.” At length, in the year of jubilee, of our salvation 1625, with the unanimous applause of the assembled Christian world, she was solemnly enrolled among the Saints by Pope Urban VIII. 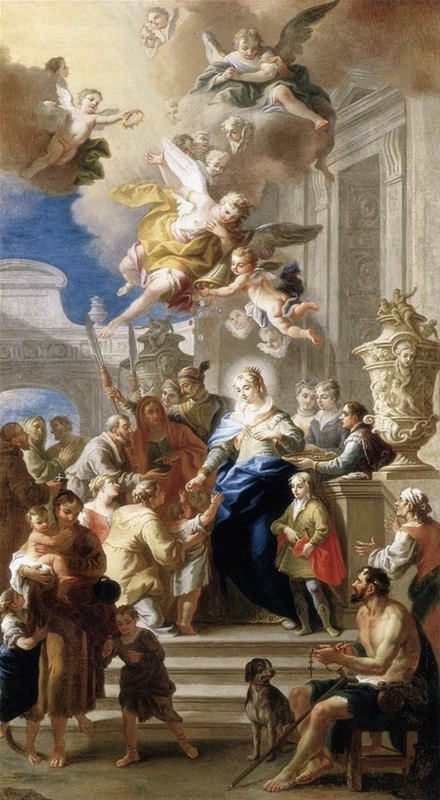 St. Elizabeth was daughter of Peter III, King of Arragon, and grandaughter of James I, who had been educated under the care of St. Peter Nolasco, and was surnamed the Saint, and from the taking of Majorca, and Valentia, Expugnator or the Conqueror. Her mother, Constantia, was daughter of Manfred, King of Sicily, and grandchild to the Emperor Frederick II. Our saint was born in 1271, and received at the baptismal font by the name of Elizabeth, from her aunt, St. Elizabeth of Hungary, who had been canonized by Gregory IX in 1235. Her birth established a good understanding between her grandfather James, who was then on the throne, and her father, whose quarrel had divided the whole kingdom. The former took upon himself the care of her education, and inspired her with an ardour for piety above her age, though he died in 1276 (having reigned sixty-three years), before she had completed the sixth year of her age. Her father succeeded to the crown, and was careful to place most virtuous persons about his daughter, whose example might be to her a constant spur to all virtue. The young princess was of a most sweet and mild disposition, and from her tender years had no relish for any thing but what was conducive to piety and devotion. It was doing her the most sensible pleasure if any one promised to lead her to some chapel to say a prayer. At eight years of age she began to fast on vigils, and to practise great self-denials: nor could she bear to hear the tenderness of her years and constitution alleged as a reason that she ought not to fast or macerate her tender body. Her fervour made her eagerly to desire that she might have a share in every exercise of virtue which she saw practised by others, and she had been already taught that the frequent mortification of the senses, and still more of the will, is to be joined with prayer to obtain the grace which restrains the passions, and prevents their revolt. How little is this roost important maxim considered by those parents who excite and fortify the passions of children, by teaching them a love of vanities, and indulging them in gratifications of sense! If rigorous fasts suit not their tender age, a submission of the will, perfect obedience, and humble modesty are in no time of life more indispensably to be inculcated; nor is any abstinence more necessary than that by which children are taught never to drink or eat out of meals, to bear several little denials in them without uneasiness, and never eagerly to crave any thing. The easy and happy victory of Elizabeth over herself was owing to this early and perfect temperance, submissiveness, and sincere humility. Esteeming virtue her only advantage and delight, she abhorred romances and idle entertainments, shunned the usual amusements of children, and was an enemy to all the vanities of the world. She could bear no other songs than sacred hymns and psalms; and from her childhood said every day the whole office of the breviary, in which no priest could be more scrupulously exact. Her tenderness and compassion for the poor, made her even in that tender age, to be styled their mother. At twelve years of age she was given in marriage to Dionysius, King of Portugal. That prince had considered in her, birth, beauty, riches, and sprightliness of genius more than virtue; yet he allowed her an entire liberty in her devotions, and exceedingly esteemed and admired her extraordinary piety. She found no temptation to pride in the dazzling splendour of a crown, and could say with Esther, that her heart never found any delight in the glory, riches, and grandeur with which she was surrounded. She was sensible that regularity in our actions is necessary to virtue, this being in itself most agreeable to God, who shows in all his works how much he is the lover of order; also, a prudent distribution of time fixes the fickleness of the human mind, hinders frequent omissions of pious exercises, and is a means to prevent our being ever idle and being governed by humour and caprice in what we do, by which motives a disguised self-love easily insinuates itself into our ordinary actions. Our saint therefore planned for herself a regular distribution of her whole time, and of her religious exercises, which she never interrupted, unless extraordinary occasions of duty or charity obliged her to change the order of her daily practices. She rose very early every morning, and after a long morning exercise, and a pious meditation, she recited matins, lauds and prime of the church office. Then she heard mass, at which she communicated frequently every week. She said every day also the little office of Our Lady, and that of the dead: and in the afternoon had other regular devotions after even-song or vespers. She retired often into her oratory to her pious books, and allotted certain hours to attend her domestic affairs, public business, or what she owed to others. All her spare time she employed in pious reading, or in working for the altar, or the poor, and she made her ladies of honour do the like. She found no time to spend in vain sports and recreations, or in idle discourse or entertainments. She was most abstemious in her diet, mean in her attire, humble, meek, and affable in conversation, and wholly bent upon the service of God in all her actions. Admirable was her spirit of compunction, and of holy prayer; and she poured forth her heart before God, with most feeling sentiments of divine love, and often watered her cheeks and the very ground with abundant tears of sweet devotion. Frequent attempts were made to prevail with her to moderate her austerities, but she always answered, that if Christ assures us that his spirit cannot find place in a life of softness and pleasure, mortification is no where more necessary than on the throne, where the passions find more dangerous incentives. She fasted three days a week, many vigils besides those prescribed by the church: all Advent; a Lent of devotion, from the feast of St. John Baptist to the feast of the Assumption; and soon after this she began another Lent, which she continued to St. Michael's day. On all Fridays and Saturdays, on the eves of all festivals of the Blessed Virgin and the apostles, and on many other days her fast was on bread and water. She often visited churches and places of devotion on foot. Charity to the poor was a distinguishing part of her character. She gave constant orders to have all pilgrims and poor strangers provided for with lodging and necessaries. She made it her business to seek out, and secretly relieve persons of good condition who were reduced to necessity, yet out of shame durst not make known their wants. She was very liberal in furnishing fortunes to poor young women, that they might marry according to their condition, and not be exposed to the danger of losing their virtue. She visited the sick, served them, and dressed and kissed their most loathsome sores. She founded in different parts of the kingdom many pious establishments, particularly an hospital near her own palace at Coimbra, a house for penitent women who had been seduced into evil courses, at Torres Novas, and an hospital for foundlings, or those children who, for want of due provision, are exposed to the danger of perishing by poverty, or the neglect and cruelty of unnatural parents. She was utterly regardless of her own conveniences, and so attentive to the poor and afflicted persons of the whole kingdom, that she seemed almost wholly to belong to them; not that she neglected any other duties which she owed to her neighbour, for she made it her principal study to pay to her husband the most dutiful respect, love, and obedience, and bore his injuries with invincible meekness and patience. Though King Dionysius was a friend of justice, and a valiant, bountiful, and compassionate prince, yet he was, in his youth, a worldly man, and defiled the sanctity of the nuptial state with abominable lusts. The good queen used all her endeavours to reclaim him, grieving most sensibly for the offence of God, and the scandal given to the people; and she never ceased to weep herself, and to procure the prayers of others for his conversion. She strove to gain him only by courtesy, and with constant sweetness and cheerfulness cherished his natural children, and took great care of their education. By these means she softened the heart of the king, who by the succour of a powerful grace, rose out of the filthy puddle in which he had wallowed for a long time, and kept ever after the fidelity that was due to his virtuous consort. He instituted the Order of Christ in 1318; founded, with a truly royal magnificence, the university of Coimbra, and adorned his kingdom with public buildings. His extraordinary virtues, particularly his liberality, justice, and constancy, are highly extolled by the Portuguese, and after his entire conversion, he was the idol and glory of his people. A little time before his perfect conversion there happened an extraordinary accident. The queen had a very pious, faithful page, whom she employed in the distribution of her secret alms. A wicked fellow-page envying him on account of this favour, to which his virtue and services entitled him, treacherously suggested to his majesty that the queen showed a fondness for that page. The prince, who by his own sensual heart was easily inclined to judge ill of others, gave credit to the slander, and resolved to take away the life of the innocent youth. For this purpose he gave order to a lime-burner, that if on such a day he sent to him a page with this errand to inquire, “Whether he had fulfilled the king's commands?” he should take him and cast him into the limo-kiln, there to be burnt; for that death he had justly incurred, and the execution was expedient for the king's service. On the day appointed he despatched the page with this message to the lime-kiln: but the devout youth on the road passing by a church, heard the bell ring at the elevation at mass, went in and prayed there devoutly; for it was his pious custom, if ever he heard the sign given by the bell for the elevation, always to go thither, and not depart till mass was ended. It happened, on that occasion, that as the first was not a whole mass, and it was with him a constant rule to hear mass every day, he stayed in the church, and heard successively two other masses. In the meantime, the king, who was impatient to know if his orders had been executed, sent the informer to the lime-kiln, to inquire whether his commands had been obeyed; but as soon as he was come to the kiln, and had asked the question, the man supposing him to be the messenger meant by the king's order, seized him, and threw him into the burning lime, where he was soon consumed. Thus was the innocent protected by his devotions, and the slanderer was overtaken by divine justice. The page who had heard the masses went afterwards to the lime-kiln, and having asked whether his majesty's commands had been yet executed, brought him word back that they were. The king was almost out of himself with surprise when he saw him come back with this message, and being soon informed of the particulars, he easily discovered the innocence of the pious youth, adored the divine judgments, and ever after respected the great virtue and sanctity of his queen. St. Elizabeth had by the king two children, Alphonsus, who afterwards succeeded his father, and Constantia, who was married to Ferdinand IV, King of Castile. This son, when grown up, married the Infanta of Castile, and soon after revolting against his own father, put himself at the head of an army of malcontents. St. Elizabeth had recourse to weeping, prayer, fasting, and almsdeeds, and exhorted her son in the strongest terms to return to his duty, conjuring her husband at the same time to forgive him. Pope John XXII wrote to her, commending her religious and prudent conduct; but certain court flatterers whispering to the king that she was suspected of favouring her son, he, whom jealousy made credulous, banished her to the city of Alanquer. The queen received this disgrace with admirable patience and peace of mind, and made use of the opportunity which, her retirement afforded, to redouble her austerities and devotions. She never would entertain any correspondence with the malcontents, nor listen to any suggestions from them. The king himself admired her goodness, meekness, and humility under her disgrace; and shortly after called her back to court, and showed her greater love and respect than ever. In all her troubles she committed herself to the sweet disposal of divine providence, considering that she was always under the protection of God, her merciful father. Being herself of the most sweet and peaceable disposition, she was always most active and industrious in composing all differences between neighbours, especially in averting war, with the train of all the most terrible evils which attend it. She reconciled her husband and son, when their armies were marching one against the other; and she reduced all the subjects to duty and obedience. She made peace between Ferdinand IV, King of Castile, and Alphonsus de la Cerda, his cousin-german, who disputed the crown: likewise between James II, King of Arragon, her own brother, and Ferdinand IV, the King of Castile, her son-in-law. In order to effect this last she took a journey with her husband, into both those kingdoms, and to the great satisfaction of the Christian world, put a happy period to all dissensions and debates between those states. After this charitable work, King Dionysius, having reigned forty-five years, fell sick. St. Elizabeth gave him most signal testimonies of her love and affection, scarce ever leaving his chamber during his illness, unless to go to the church, and taking infinite pains to serve and attend him. But her main care and solicitude was to secure his eternal happiness, and to procure that he might depart this life in sentiments of perfect repentance and piety. For this purpose she gave bountiful alms, and caused many prayers and masses to be said. During his long and tedious illness he gave great marks of sincere compunction, and died at Santaren, on the 6th of January, 1325. As soon as he had expired, the queen retired into her oratory, commended his soul to God, and consecrating herself to the divine service, put on the habit of the third Order of Saint Francis. She attended the funeral procession, with her husband's corpse, to Odiveras, where he had chosen his burying-place in a famous church of Cistercian monks. After a considerable stay there she made a pilgrimage to Compostella, and returning to Odiveras, celebrated there her husband's anniversary with great solemnity; after which she retired to a convent of Clares, which she had begun to rebuild before the death of her husband. She was desirous to make her religious profession, but was diverted from that design for some time upon a motive of charity, that she might continue to support an infinity of poor people by her alms and protection. She therefore contented herself at first with wearing the habit of the third Order, living in a house which she built contiguous to her great nunnery, in which she assembled ninety devout nuns. She often visited them, and sometimes served them at table, having for her companion in this practice of charity and humility her daughter-in-law, Beatrix, the queen then reigning. However by authentic historical proofs it is evinced that before her death she made her religious profession in the aforesaid third Order, as Pope Urban VIII, after mature discussion of those monuments, has declared. A war being lighted up between her son Alphonsus IV, surnamed the brave King of Portugal, and her grandson, Alphonsus XI, King of Castile, and armies being set on foot, she was startled at the news, and resolved to get out to reconcile them, and extinguish the fire that was kindling. Her servants endeavoured to persuade her to defer her journey, on account of the excessive heats, but she made answer that she could not better expend her health and her life than by seeking to prevent the miseries and calamities of a war. The very news of her journey disposed both parties to peace. She went to Estremoz, upon the frontiers of Portugal and Castile, where the son was; but she arrived ill of a violent fever which she looked upon as a messenger sent by God to warn her that the time was at hand wherein he called her to himself. She strongly exhorted her son to the love of peace and to a holy life; she confessed several times, received the holy viaticum on her knees at the foot of the altar, and shortly after extreme unction; from which time she continued in fervent prayer, often invoking the Blessed Virgin, and repeating these words: “Mary, mother of grace, mother of mercy, defend us from the wicked enemy, and receive us at the hour of our death.” She appeared overflowing with heavenly joy, and with those consolations of the Holy Ghost which make death so sweet to the saints; and in the presence of her son, the king, and of her daughter- in-law, she gave up her happy soul to God on the 4th July, in the year 1336, of her age sixty-five. She was buried with royal pomp in the church of her monastery of poor Clares, at Coimbra, and honoured by miracles. Leo X and Paul IV granted an office on her festival; and in 1612 her body was taken up and found entire. It is now richly enshrined in a magnificent chapel, built on purpose. She was canonized by Urban VIII in 1625, and the 8th of July appointed for her festival. The characteristical virtue of St. Elizabeth was a love of peace. Christ, the prince of peace, declares his spirit to be the spirit of humility and meekness; consequently the spirit of peace. Variance, wrath, and strife are the works of the flesh, of envy, pride, which he condemns, and which exclude from the kingdom of heaven. Bitterness and contention shut out reason, make the soul deaf to the motives of religion, and open the understanding to nothing but what is sinful. To find the way of peace we must be meek and patient, even under the most violent provocations; we must never resent any wrong, nor return railing for railing, but good for evil; we must regard passion as the worst of monsters, and must judge it as unreasonable to hearken to its suggestions as to choose a madman for our counsellor in matters of concern and difficulty; above all, we must abhor it not only as sin, but as leading to a numberless variety of other grievous sins and spiritual evils. “Blessed are the peace makers,” and all who love and cultivate this virtue among men, “they shall be called the children of God,” whose badge and image they bear.